James was born on the 30th of April, 1946 in South Haven, Michigan, and his parents would move to the nearby city of Bangor where he would spend his childhood. James was a varsity athlete in four sports during high school and went on to continue playing sports at Olivet College where he graduated with a Bachelor of Arts degree in sociology and a teaching certificate in 1968. He accepted a teaching and football coaching position at South Haven High School after graduating and soon after on the 29th of August, 1968, James was drafted into the US Army. Private First Class McCloughan distinguished himself by acts of gallantry and intrepidity at the risk of his life above and beyond the call of duty from May 13th through 15th, 1969, while serving as a combat medic with Charlie Company, 3rd Battalion, 21st Infantry, 196th Light Infantry Brigade, Americal Division. The company air assaulted into an area near Tam Ky and Nui Yon Hill. On May 13th, with complete disregard for his life, he ran 100 meters in an open field through heavy fire to rescue a comrade too injured to move and carried him to safety. That same day, 2nd Platoon was ordered to search the area near Nui Yon Hill when the platoon was ambushed by a large North Vietnamese Army force and sustained heavy casualties. With complete disregard for his life and personal safety, Private First Class McCloughan led two Americans into the safety of a trench while being wounded by shrapnel from a rocket-propelled grenade. He ignored a direct order to stay back, and braved an enemy assault while moving into the "kill zone" on four more occasions to extract wounded comrades. He treated the injured, prepared the evacuation, and though bleeding heavily from shrapnel wounds on his head and entire body, refused evacuation to safety in order to remain at the battle site with his fellow soldiers who were heavily outnumbered by the North Vietnamese Army forces. On May 14th, the platoon was again ordered to move out towards Nui Yon Hill. Private First Class McCloughan was wounded a second time by small arms fire and shrapnel from a rocket-propelled grenade while rendering aid to two soldiers in an open rice paddy. In the final phases of the attack, two companies from 2nd North Vietnamese Army Division and an element of 700 soldiers from a Viet Cong regiment descended upon Charlie Company's position on three sides. Private First Class McCloughan, again with complete disregard for his life, went into the crossfire numerous times throughout the battle to extract the wounded soldiers, while also fighting the enemy. His relentless and courageous actions inspired and motivated his comrades to fight for their survival. When supplies ran low, Private First Class McCloughan volunteered to hold a blinking strobe light in an open area as a marker for a nighttime resupply drop. He remained steadfast while bullets landed all around him and rocket-propelled grenades flew over his prone, exposed body. During the morning darkness of May 15th, Private First Class McCloughan knocked out a rocket-propelled grenade position with a grenade, fought and eliminated enemy soldiers, treated numerous casualties, kept two critically-wounded soldiers alive through the night, and organized the dead and wounded for evacuation at daylight. His timely and courageous actions were instrumental in saving the lives of his fellow soldiers. Private First Class McCloughan's personal heroism, professional competence, and devotion to duty are in keeping with the highest traditions of the military service and reflect great credit upon himself, the Americal Division, and the United States Army. Originally, his actions were recommended for the Distinguished Service Cross but was downgraded to a Bronze Star with V device. James left Vietnam in March of 1970 and was discharged later that year at the rank of Specialist 5. James was able to return to his job at South Haven High School and in 1972 he earned a Master of Arts degree in counseling and psychology from Western Michigan University. He then taught psychology at South Haven High School until his retirement in 2008 for which he received the Michigan Education Association's 40 years of service award. During that time James also coached 22 years of wrestling and 38 years of football and baseball, receiving many service awards for his coaching. 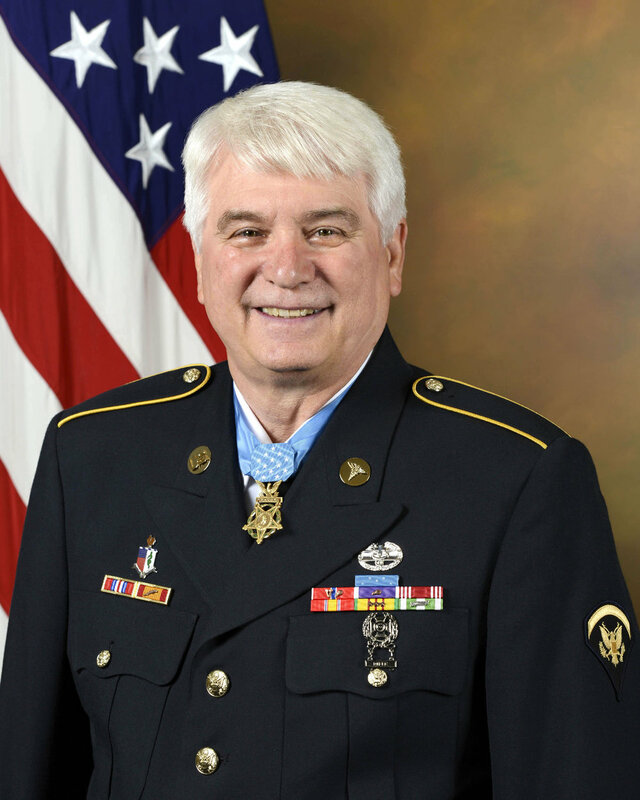 Almost 40 years after James's actions, his former platoon leader resubmitted his nomination for the Distinguished Service Cross, which was then recommended for upgrade to the Medal of Honor by the Secretary of Defense in 2016. On the 23rd of December, 2016, the National Defense Authorization Act for Fiscal Year 2017 was signed and this included a waiver to the five year time limit on Medal of Honor awards. Four days later, James's certificate was signed and on the 13th of June, 2017, James received the Medal of Honor from President Trump in a ceremony at the White House. His induction into the Pentagon's Hall of Heroes was the next day. James C McCloughan still lives in South Haven with his wife Cherie.